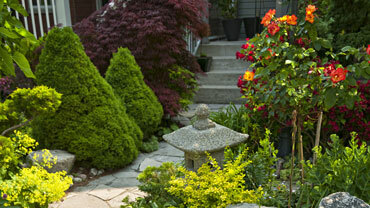 Our Saskatoon landscapers have 35 years of experience. We got our start with only one John Deer lawn mower and within a year, we had enough customers to expand our services and equipment. Open Roads Forever Green Lawn Care began as a small snow removal company offering residential and small commercial snow clearing. With the request from many of our snow customers to do summer work, the spring of 1996 was our first season of yard services. Within months, we had to hire help to handle the numerous requests for our services. Many customers referred their friends as our quality work and prompt service became well known. Over the years, with the hiring of professional staff, our company has grown to 14 trucks and many pieces of heavy equipment which include:, two 17 foot cube van for sprinkler and sod installations, two dump trucks, a bobcat, and two John Deere tractors. Also all of our trucks are GPS monitored. We now cut lawns of varying sizes from small residential properties to 1100 acres fields. With the yearly renewal of our services and the many referrals, we have grown a very strong customer base. Our dedication to service started out of our one car garage behind our home. Soon we found the need to build an additional garage and in 2000, we had to move to our current commercial location conveniently located at 1228 Avenue W South. Our 1/2 acre compound is complete with a shop office & storage facilities to house all of our equipment. In 2003, we purchased the property next to us that had a workshop. We now have six commercial lots and find the need for more space. With our constant dedication to customer service and quality work, we have grown from a one man operation to over 15 staff during our peak season. With the continual training of our staff in the latest landscaping practices, we see our future turning greener every year.